Leeds Beckett University maintained their scintillating form to clinch a home quarter-final in the BUCS Super Rugby Championship play-offs following a bonus-point win over Durham University. Kerry Wood’s side extended their unbeaten run to nine matches and their impressive sequence of results means they will now host Cardiff Met University next week. In terms of Durham, they will travel to the University of Bath in the last eight after Hartpury University finished the season in second place following their convincing victory against Nottingham Trent University. Below is a review of the final domestic fixtures in BUCS Super Rugby plus, we round-up some of the other action from across university rugby. Leeds Beckett University sealed a home BUCS Super Rugby Championship quarter-final as they extended their unbeaten run to nine matches against Durham University. Tries from Chester Duff and Will Lewin helped the hosts into a 12-0 half-time lead. Touchdowns from replacement Adam Mallinson and Jack Conteh saw Durham bounce back as the away side moved in front. However, Beckett responded with their third try of the afternoon before John Okafor wrapped up the win for Kerry Wood’s side. Beckett haven’t tasted defeat since the beginning of December and they head into the play-offs in a confident mood whilst Durham have lost their last three matches. Hartpury University comfortably beat Nottingham Trent University to claim second place in BUCS Super Rugby. The current BUCS Super Rugby Championship holders ran in nine tries and led 35-5 at break at Lady Bay. It was first blood to Hartpury after the restart, but Trent hit back as Scott Hall added to Tommie Collingwood’s earlier score. In a frantic second period, the home side were able to claim a try-bonus point while Hartpury scored two tries of their own to seal the win. Sean Lynn’s men will now host Northumbria University in the quarter-finals next week. The BUCS Vase final in Nottingham will be contested by South A champions Hartpury 2nds and the University of Bristol. Hartpury beat Exeter 2nds 23-17 at home while Bristol stunned BUCS Super Rugby play-off contenders Swansea University by securing a 34-19 win. The final will take place in two weeks’ time as part of BUCS’ Big Wednesday. The University of Sheffield took a huge step towards the North B title after a pulsating 55-41 victory against the University of Stirling. 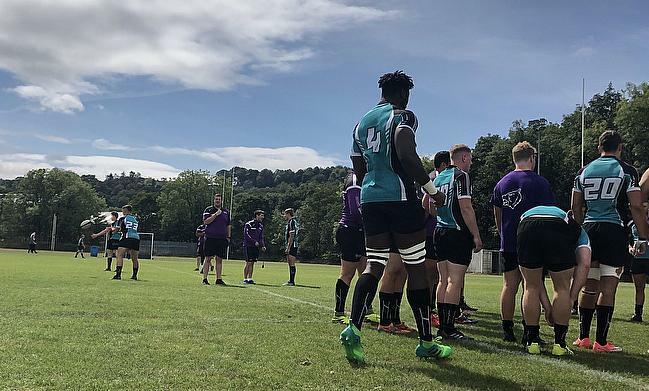 The Yorkshire outfit have played all of their domestic fixtures, but they are only four points clear of rivals the University of Manchester, who beat the University of Glasgow 26-21 on Wednesday. The win for Manchester means they must pick up another bonus-point victory against Glasgow next week to stand any chance of finishing on top of the division. However, Glasgow are also in this gripping title race. The Scottish outfit are six points behind Sheffield with two games left to play. First up, they face Stirling on Saturday and they must pick up a positive result in order to set-up a potential championship decider against Manchester next Wednesday. Elsewhere, Durham 3rds finished their season on a high by beating the University of Strathclyde. St Mary’s University have been crowned champions of South B after thrashing Cardiff Met 3rds 54-9. With one league game remaining, they can no longer be caught while the only other match in this league saw the University of Portsmouth beat Cardiff 2nds 19-12. Manchester Met University have secured back to back league title as they impressively clinched the Northern 1A crown on Wednesday. In their first year at this level, Rob Jones’ side defeated the University of Liverpool 45-11 to earn top spot. MMU will now play a round-robin playoff against Scottish 1A champions, the University of Aberdeen and Midlands 1A winners, the University of Leicester, for a place in the third tier of university rugby. Keele University pipped Sheffield Hallam University to the Northern 2A title on Wednesday. After Hallam were awarded a walkover result against UCLAN, Keele had to settle for a draw with Lancaster University and that result proved to be enough. In Northern 2B, Leeds Beckett 2nds edged closer to securing the silver medal spot after hammering Sheffield 2nds 40-19. Closest rivals, the University of York, fell to a 50-20 loss at home to Leeds 2nds, who are also in the hunt for second place. In the final round of domestic games next week, Beckett 3rds face York while Leeds take on Beckett 4ths. In the last week of matches in Northern 3A, Manchester Met 2nds replicated their first XV as they beat Liverpool 3rds 31-0. MMU clinched third spot with the victory while Bangor University finished fourth after their 42-5 win over Edge Hill University. In Midlands 1A, Nottingham Trent 2nds couldn’t avoid finishing at the foot of the table as they lost 14-10 to Loughborough 3rds while in 2A, Nottingham 2nds ended a strong campaign with a 20-10 win against Warwick 2nds.